A while back, I introduced you to Osaka’s 5 great owl cafes. There are some Owl-themed cafes in Kyoto too, including a few where you can actually watch and touch living owls. Here are three different ways to admire this beautiful animal in Kyoto! Literally translated as the Owls’ Forest, Fukurou no Mori really is a mini-forest in the middle of Kyoto rather than a cafe. The mini-forest inside this modern building hosts around 15 living-owls of different kinds and characters. Patrons can enter the Owls’ Forest to admire the owls and gently pat them with the back of your hand to feel their beautiful feathers. You can also have the experience of an owl riding on your hand with a guidance of staff. There is a particularly popular owl, named “White” which is a popular breed of the Eurasian eagle owl. Its distinct erect ear tufts are so cute yet comical, and its big eyes chase you as you walk around him. And, yes, of course, there is also a snowy owl named Hedwig, just like the one in Harry Potter. You can enter Fukurou no Mori with the entrance fee of between 11:30 to 19:30. Right next to the Owls’ Forest, there is also the Forest of Bengal Cats. There is a discount for those who want to enter to both facilities (for combined tickets, it is ¥1,350 for adults, ¥1,000 for children under 12). Kyoto Fukurou no Mori is in the middle of Kyoto, located only a few minutes walk into Shinkyogoku street. There is another branch of Owls’ Forest for those traveling to Arashiyama area, Arashiyama Fukurou no Mori, which has around 20 owls from all over the world. Kyoto Fukuro no Mori Arashiyama is one of the biggest owl cafes in Japan. You can see the beautiful landscape of Arashiyama from the window. 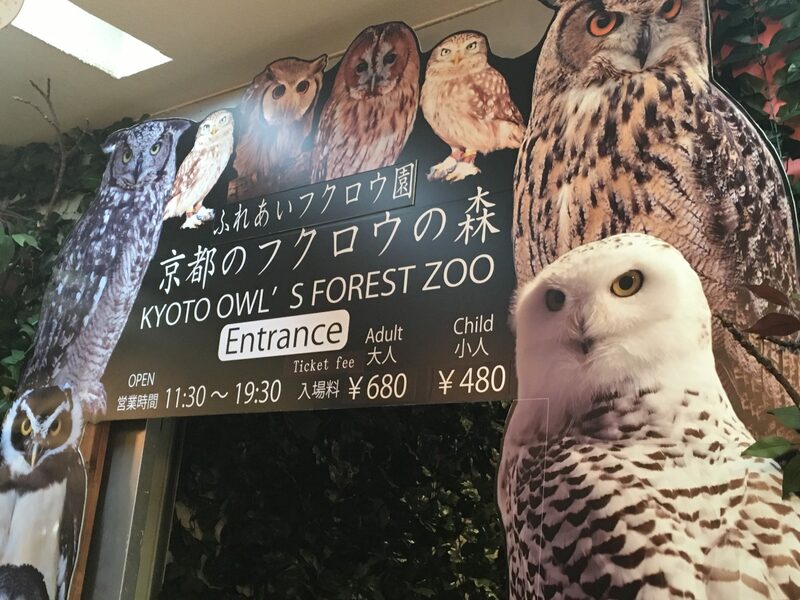 The Arashiyama Owls’ Forest is open from 10:00 to 17:30, with the same entrance fee. It is located on the 2nd floor of Arashiyama Square Building, a few minutes walk from Togetsukyo bridge. 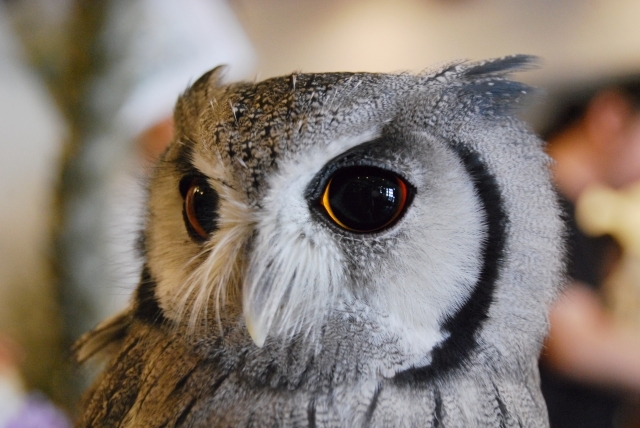 Next,let’s meet the most popular owl called Uri chan in Kyoto! “Fukurou no Mise + Plus” is a cute select/pet shop and cafe selling anything owl, where you can also interact with living owls. When you enter the shop, you will sure be excited to see various cute owl-themed goods of the store. Owl shaped soap dispenser and bath goods or owl key rings could be perfect souvenirs for your friends. If you go further into the store, you will be greeted with an actual owl that is stationed in the middle of the store. If you want to interact with owls, you can register. You will be guided on proper ways to interact them, then you can mingle and interact with the beautiful friends. Uri has beautiful fluffy feathers and its face is very calming and smiley when it is sleeping. The shop is open from 12:00-20:00 on weekdays and 11:00 – 20:00 on weekends. Only around 10-15 people might be admitted at one time. 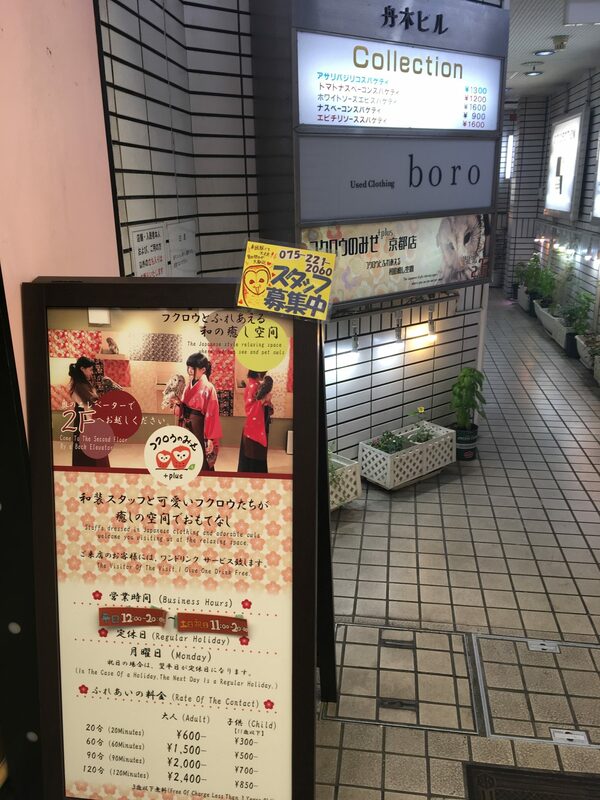 The shop is conveniently located in the major shopping area in the middle of Kyoto. ※If Monday is national holiday, next day will be closed instead. Age of kids are limited from 1 to 12 years old and adult should accompany to enter. I would like to introduce you another owl cafe. This cafe does NOT have any living owl, so do not go there expecting to touch one. 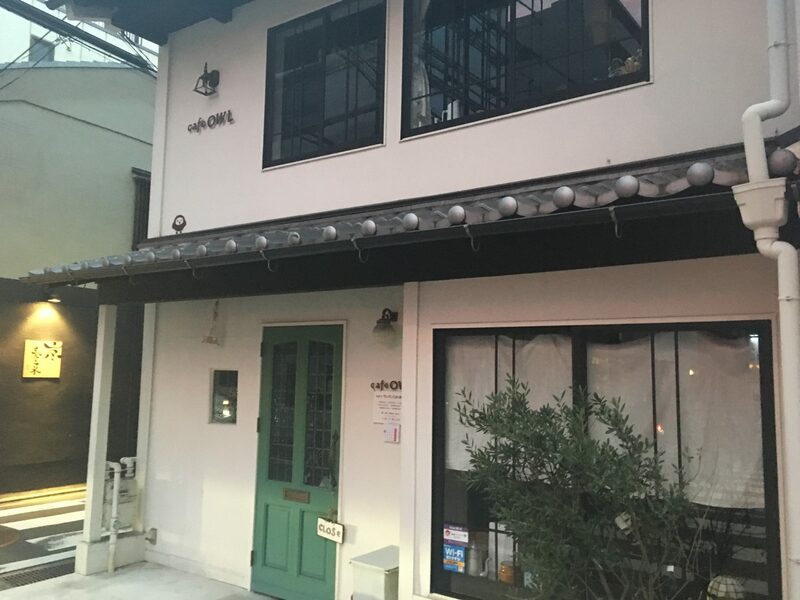 Cafe Owl is an owl themed cafe that is in a renovated machiya house. Machiya is a traditional wooden house that is popular in Japan, particularly in Kyoto. This is a great cute cafe owed by a nice couple serving great food, cakes and coffee. If you like owl goods, you would love this cafe. Not only do they have top-notched food and pastries in the beautiful ambiance but the cafe has owl goods hidden everywhere for you to find. Popular food here are either “Owl Lunch Set” which is a deli-plate lunch packed with various vegetable dishes or Sakanaya-don, which is basically a Kaisen-don (raw fish on the bed of sushi rice). Kyoto no Fukuro no Mori・・・The mini-forest inside hosts around 15 living-owls of different kinds and characters. Have a great time with cute owls and don’t miss meeting the popular owls in Kyoto! Local Guide:Nishiki Market in Kyoto!Top 5 Must Eat Foods and restaurant Local tells Top 5 Cooking Classes in Kyoto! Experience Japanese cooking! Local tells Top 5 best Supermarkets in Kyoto! Local Guide:Sanjusangendo in Kyoto!1001 Kannon Statues will welcome you! Local Guide:Arashiyama in Kyoto Japan!The best walking course Local Guide:Haradanien,the most beautiful Cherry blossoms in Kyoto! Local tells Top 5 Must-Try restaurants around JR Kyoto station! Local tells Top 5 best Yakiniku restaurants in Kyoto!